﻿﻿﻿﻿Bilge International Journal of Science and Technology Research is an international journal which publishes scientific articles linking Life and Natural Sciences, Engineering and Technology. Authors should only submit original articles, which has not been previously published and is not currently considered for publication elsewhere. Two issues a year (March and September) are published in Turkish or English. 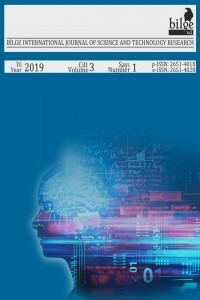 The journal is indexed in Researchbib, AcademicKey, International Institute of Organized Research (I2OR), Cosmos Index, Google Scholar, Journal Factor, Index Copernicus,JIFACTOR, Science Library Index, Sindexs, Rootindexing, DRJI, ROAD, Araştırmax, BASE. The articles of our journal are given the DOI number through DergiPark.